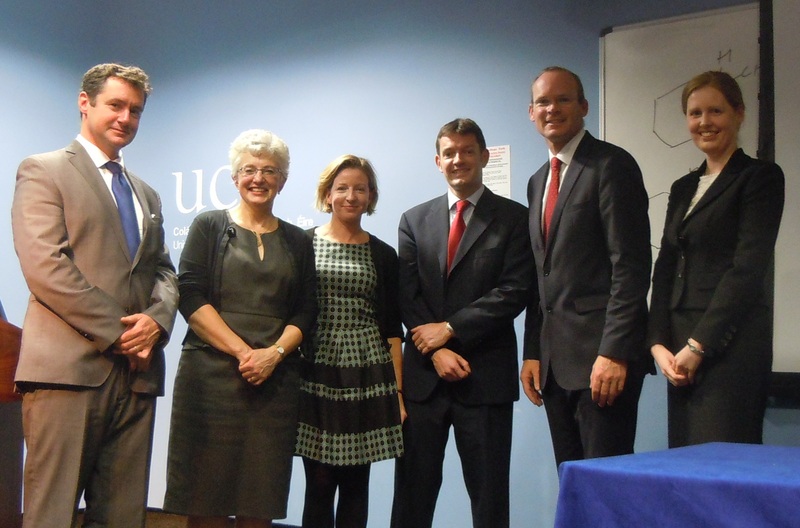 On September 19, Constitution Project @ UCC hosted a public debate information event on the referendum on the proposed abolition of the Seanad, which was attended by almost 200 people. The event was chaired by broadcaster George Hook, and began with contextual information on the Seanad from three disciplinary perspectives. Fiona Buckley of the Department of Government at UCC gave a political science perspective; Dr Maria Cahill of the Faculty of Law at UCC spoke about the implications for constitutional law; and Professor John A Murphy, Emeritus Professor of History at UCC, gave a historical account of the Seanad. This was followed by the debate, where abolition of the Seanad was proposed by Simon Coveney TD, Minister for Agriculture, and Dr Eoin O’Malley of the School of Government at DCU. The motion was opposed by Senator Katherine Zappone and Dr Conor O’Mahony of the Faculty of Law at UCC. A substantial number of audience members made contributions from the floor. At the conclusion of the evening, a vote was taken on the motion: “That this House would support the abolition of the Seanad”, and was defeated by a significant margin. The event was covered in the Irish Times (click here). Videos of the contributions are available below.